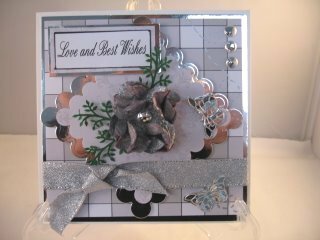 Paper flowers may not always be to the colour you want for the card you have in mind, but altering them is an easy task. These lilac paper ones are very pretty but they are not the right colour for my scheme plus they are too big. The depth of them makes it awkward to get an envelope or box to fit and so I set about altering them. The first thing I needed to do was dismantle the whole flower into it's separate parts. I don't need the green leaves for this task, but keep them in case you need them for another one project in the future. Then I sprayed the whole lot with some silver Glimmer Mist. This is a liquid that has fine particles of Mica in it and so makes the petals shine. 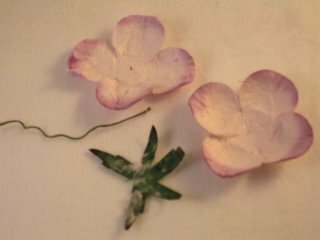 While the petals are still wet I used some tweezers and twisted the ends of each one. 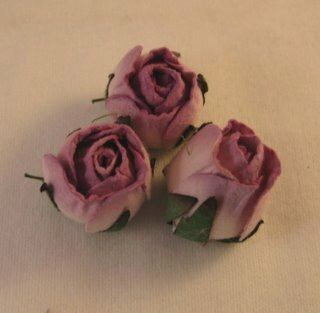 Once the petals are dry they will go a little stiff and keep the curl better. 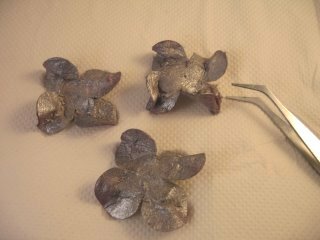 With some wet glue layer them up, offsetting each set of petals as you go. Add a Gemstone or Pearl, or a coloured Brad to the centre. Then add them singly or in a cluster to your cards. This colour way is silver and grey and I have Matted and Layered each element to compliment the other. 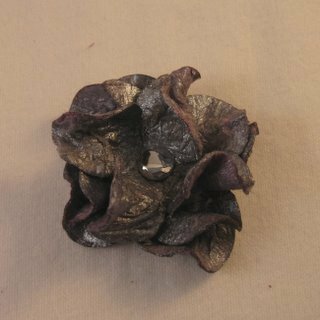 So for my project altering flowers was the right thing to do, and I am sure you will agree it looks nothing like the original. There is also a video to show you another way to alter any of the flowers that you buy but for this you will need some Isopropyl Alcohol that you can get from the chemist.